100% Russian tape hair extensions from real human hair. Pre-taped permanent hair extensions are easy and ready to apply. Our hair is a high premium grade. You can re-tape the hair after 3 months and then re-apply. This technique is not damaging to the natural hair. We have a wide range of colours to choose from. 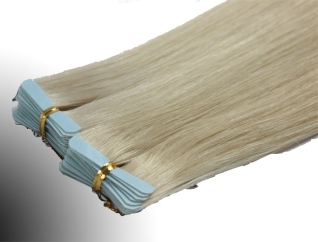 Russian Tape Hair Extensions also known as Seamless Hair Extensions. These are another form of wefted hair. The hair is attached to transparent polyurethane adhesive tape. Russian Taped Weft Extensions are a sandwich technique, a thin section of the natural hair is taken and one strip is applied underneath and another on top, then sandwiching the hair in between.